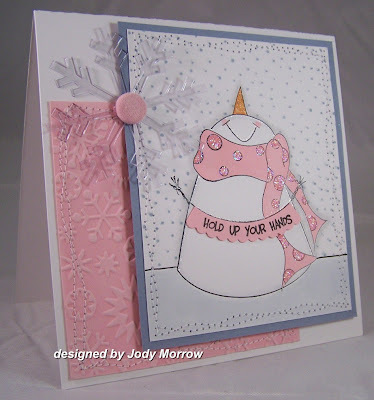 My inspiration behind this card was the cute little banners that Jenn Balcer has been making. I initially wanted to make it into a pennant banner, but that was *not* working out, so she is holding a scalloped banner instead. I actually used scalloped scissors in it, which is something I rarely do. LOL It's just a me thing. LOL I drew the line for the ground (yay me for drawing ANYTHING). The snow stamp is from CHF (Cornish Heritage Farm). My daughter, Bailey pointed out that this card does not have ribbon on it. *GASP* She said it was least favorite of the 3 I stamped. *EEK* My girl is being trained well I guess. LOL Her favorite of the 3 will be posted next time. :) I am posting them in the order that I stamped them. VERY cute Jody...I'm loving your snowgirls!! And the banner worked out perfect!! Wow, another fabulous, fabulous card. I love the pink and white, and how you scalloped a banner. Too cute! Super duper cute Jody! I LOVE your snowgirl cards! Too bad they are sold out now...darn! Too cute girl! Love her! akkk...this is just adorable! LOVE your snowwoman!!! heeheee!!! fabulous! Oh I love your pink cards, they look gorgeous!! Aaaahhhh she's so adorable!!! Love the pink card too!!! !